Since 1949 one of the primary missions of the Institute of Buddhist Studies has been to provide a comprehensive program of education and training for persons aspiring to enter the Shin Buddhist ministry in the West. The significance and effectiveness of that effort has long been recognized by the Buddhist Churches of America and the Jōdo Shinshū Hongwanji-ha in Kyoto, Japan. As a result, over the years scores of IBS graduates have been able to receive tokudo ordination, kyōshi certification and kaikyōshi status as overseas Shin ministers from the Hongwanji. 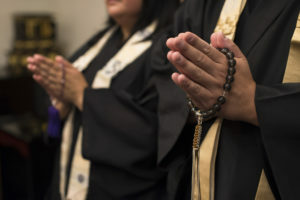 Whereas students pursuing a career in Jōdo Shinshū ministry may complete their studies in any of our degree programs, students are generally encouraged to complete the Master of Divinity program. Students may also wish to complete the Certificate in Shin Buddhist Studies and are encouraged to pursue study at Ryukoku University in Kyoto, Japan, as part of their program. The ministerial program is overseen by Rev. Dr. David Matsumoto. Applicants are encouraged to consult with Dr. Matsumoto for guidance in choosing the appropriate path of study.